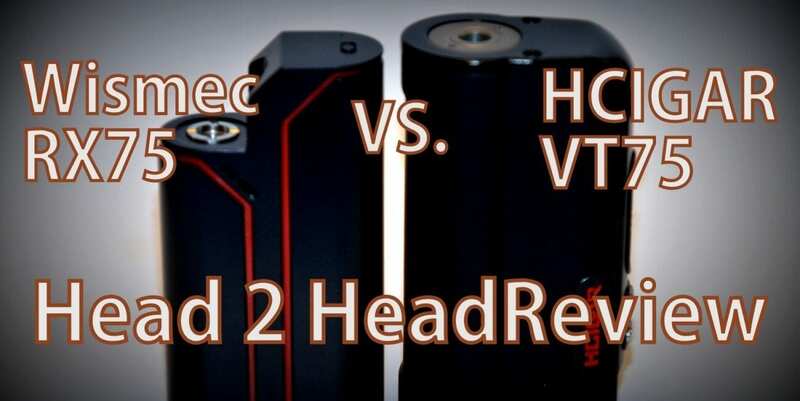 Head to Head: RX75 VS. VT75 Review - Daily Vaping Deals & The Best Vape Product Reviews at Vaping Cheap! Today I’ll be doing my first ever “head to head” review, essentially I’m reviewing two mods with similar specifications and form factors with competing chip sets. One is using the Wismec / Joyetech chip set, while the other is based on an Evolv set of guts with the new DNA 75 board. Both of the mods provided for this review came from the awesome team over at Vapor DNA. 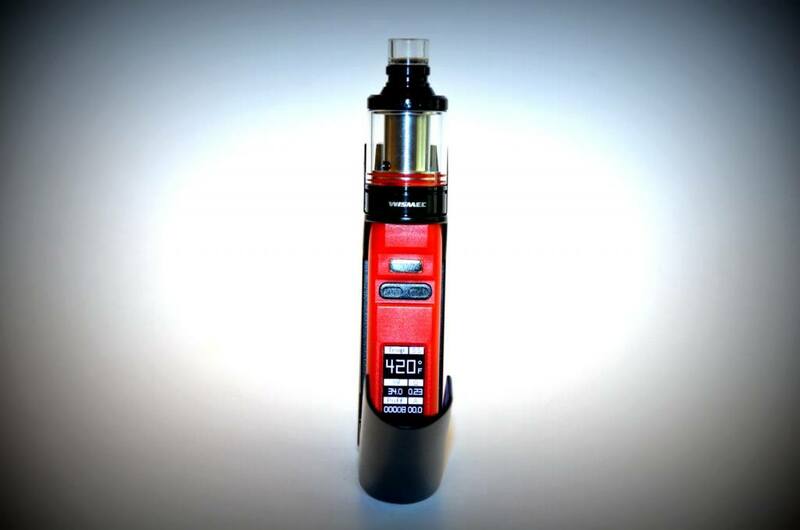 The Wismex Reuleaux RX75, at the time of this review, is currently available for $54.99 and can be found here. 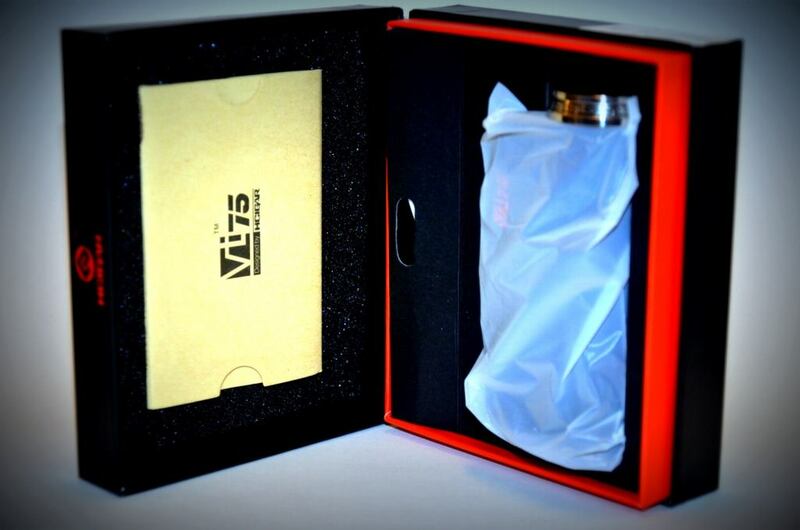 The HCigar VT75 is selling for $94.99 and you can get your own right here. As this is a head to head review, I will not be going quite as far in depth on either mod as I usually do with my reviews, but I will try to be just as thorough where it counts. This is by design, so if I manage to miss something you want to know about, please put it in the comments below so that i can address it. My goal is to be as informative as possible so that you have all the information you need to be completely informed on the products. WismecReuleaux – RX75, smoke plastic front door, Amor tank, charging cable, instructions, 2 coils, 2 drip tips and spare door screws. 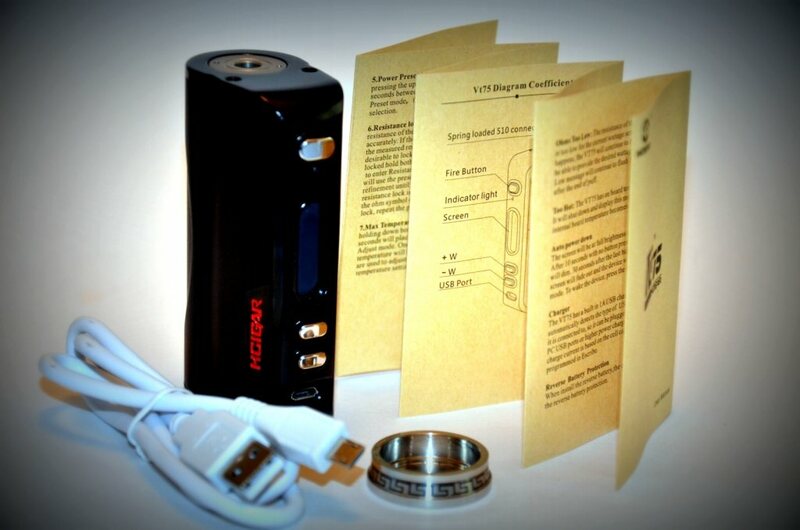 HCigar VT75 – VT75, Beauty Ring, 18650 battery adapter, charging cable and instructions. Wismec Reuleaux RX75 – This feels pretty durable, and the design is unusual as it’s not a true “sidewinder” or side by side style mod, but the tank does sit a little lower on the mod than the battery, slightly reducing the overall height when in use. 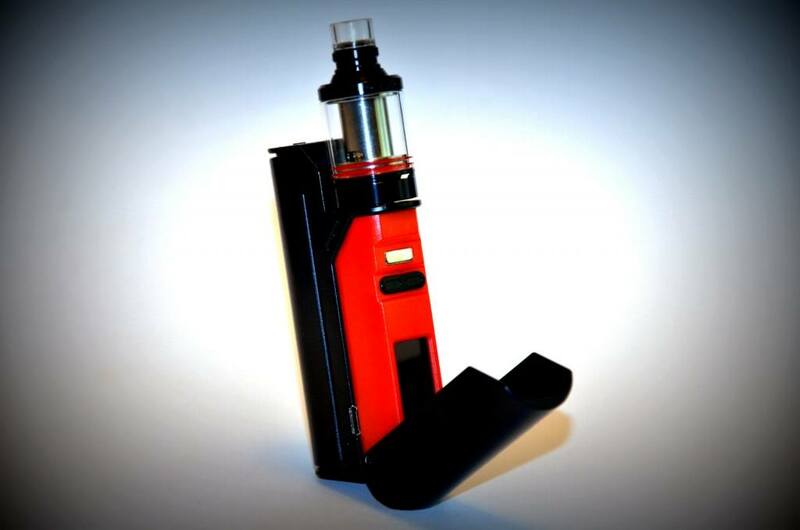 Short tanks, such as the included Wismec Amor Mini or the Goblin Mini look awesome on top of this. The spacing is more like 23 or 24 mm around the 510 connector, meaning that tanks like the Uwell Crown (with it’s airflow ring) will actually fit, barely, but it works. 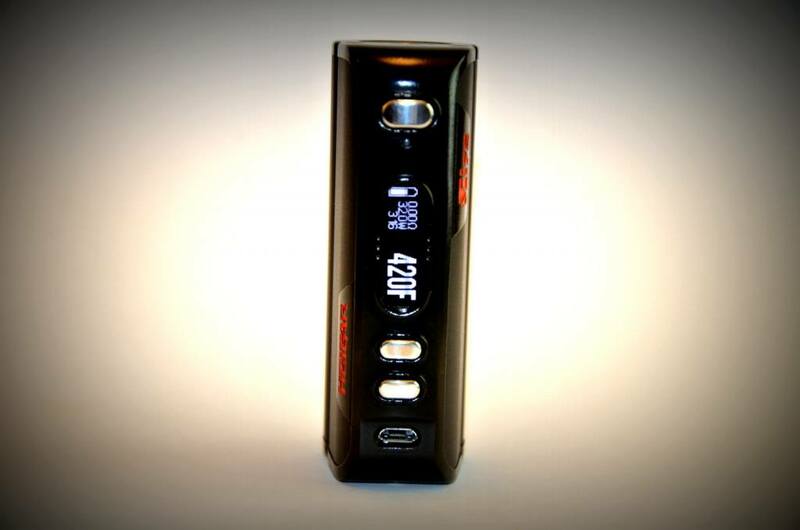 In it’s shipping configuration, there is a metal hinged cover over the front display and controls, but this can be changed out with an included smoke colored plastic front cover that allows visibility of the display while using the mod. The display is very large and beautiful, and hidden behind the hinged front cover, it is well protected. The battery door and the front hinged cover are held in place with some pretty strong magnets, and nothing shifts around while using the mod. Both the front and the back are well rounded, resulting in a nicely shaped mod that feels good to hold. The tank included in the kit, however, feels small and cheap. The included coils are a total failure in the one I received, they were both defective and didn’t work at all, so I was unable to test or review the tank as I didn’t have any spares. 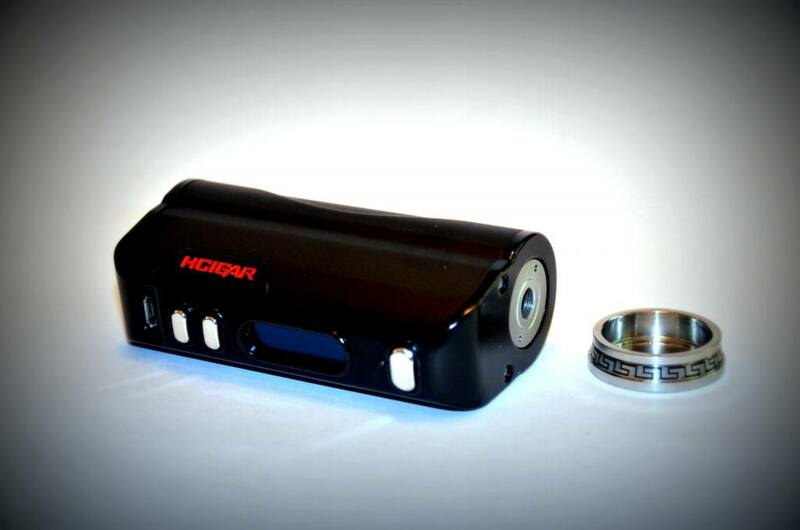 HCigar VT75 – This mod feels rock solid. The battery cap threads and removable 510 plate threads are a bit rough, and not as smooth as I would like, but they do work. The mod is big and slightly cumbersome feeling, but not uncomfortably so. It does not feel quite as nice in my hand as my favorite 26650 mod, the Beyond Vape Centurion, but it isn’t bad either. The firing button is on the small side, much smaller than most of my other mods, but at least it doesn’t rattle. The display is a little small, compared to the RX75, but is inset into the body of the mod which helps keep it protected. The included beauty ring is actually a worse design than the one for the Centurion, unlike that one, it doesn’t mount on the top at all, but hey, at least it looks great once in place. I did notice within minutes that the mod seems to be uneven, and wobbles a bit when set down flat, because the base does not seem to be perfectly level and flush. The stainless battery cap has a center threaded screw so that you can adjust the fit for different sized batteries. Wismec Reuleaux RX75 – Lets start with the finish, it is the gorgeous and durable Joyetech finish that I have come to really respect. It holds up to the abuse I put it through and continues to look great. The 510 connector is spring loaded and seems to function properly. Unfortunately, it does suffer from the problem that most Wismec / Joyetech designs have, it’s very shallow and not all tanks will sit flush as a result. Every tank I put on it works, but not all of them look good because of the gap between the base and the top of the 510 connector. Otherwise, everything seems to fit together pretty well. Fire button hidden in back, squeeze battery door to actually fire the mod. Adjustment buttons are hidden in the front under the “folding” panel, along with the display. Hinged front panel is secured with a pretty strong magnet at the top and a single screw on either side at the bottom that doubles as the “hinge”. These screws are mounted in the internal plastic “frame body”, and I am a little concerned over time that the plastic will strip and the hinge will be worthless, but time will tell. The design looks awesome, but in reality it is poorly designed and the RX75 can’t be stood on it’s base when the hinged front is open to access the buttons. Back mounted fire button is cumbersome when tryng to make adjustments, but works really well when just using the mod. The display, like most Wismec / Joyetech displays, bright enough to read in any light, and shows a ton of information. The one downside is they chose to use the older 75 watt chip set rather than including the newer v2 with the real time clock capability (that Joyetech has implemented). HCigar VT75 – Again, starting with the actual finish itself, the VT75 seems to be every bit as abuse friendly as the competitor in this review. Despite my hard usage, it still looks every bit as nice as it did when I took it out of the box, with one exception, the base is wearing from picking it up and setting it down on the points where the mod wobbles as noted above. I am pretty unimpressed with the beauty ring, as nice as it looks, it feels like an after thought, and not an integral part of the kit. I do wish it had some way to be affixed to the mod, that would make it seem more like it’s supposed to be there. The 510 connector is a bit unusual, the 20mm face of it unscrews completely from the mod, leaving the center pin attached. Presumable this is for attaching a hybrid style tank and / or cleaning the connector. The issue here is the threads, since they also act as the negative contact (ground), they have to be clean and metal to metal in order to function properly, otherwise you can get sporadic performance from the mod. The center pin is spring loaded though, and I had no issues with any of my tanks making a good connection. The buttons have a quality feel to them and provide very good “clicky” tactile feedback. The don’t rattle or make any unintended noise, but the firing button is a little small for my liking. The display is your traditional DNA sized display, and contains enough information to use the mod and see all the necessary information. It is bright enough to be clearly visible in all but the brightest sunlight. The display is slightly inset into the body, with an additional ridge around it that gives it an added layer of protection. The USB port is front mounted and easily accessible. The included 18650 battery adapter does introduce a slight amount of battery rattle, at least with my batteries. the adjustable battery cap does help reduce it, but I could not completely eliminate it. Wismec Reuleaux RX75 – There are no surprises here, this mod works flawlessly like every other Wismec / Joyetech based mod on the market. Basically, take it out of the box, put the battery in it (pay attention here, it does go in upside down), mount a tank on it, set your favorite settings and vape. There is a slight twist to it though, with the fire button being rear mounted, making adjustments is a bit of a trick. It is easy to accidentally depress the fire button while holding it and trying to use the up and down adjustment buttons. There is a physical lock to keep from accidentally depressing the fire button, which really comes in handy since you simply squeeze the mod to fire it, like the Smok X-Cube series mods. Once locked, it won’t accidentally auto-fire in your pocket. 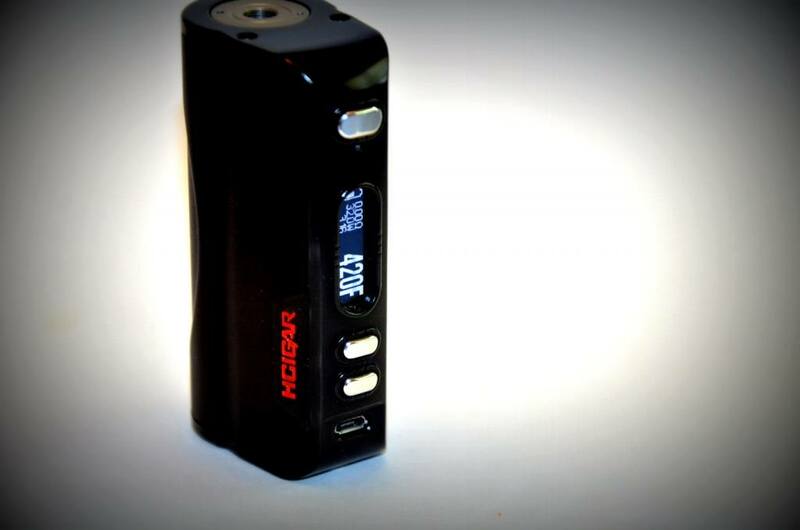 HCigar VT75 – Unlike the RX75, out of the box this mod is not the best. It is usable, but if you are used to the Evolv DNA 200 mods, this one is a bit of a letdown. While it is usable, it is not a stellar performer. I had a hell of a time getting it adjusted properly, and in fact had to clean the battery threads and the top threads of the 510 connector plate, as they had paint on them and did not make a great connection, causing no end of problems trying to get this mod working properly. Once the threads are cleaned off though, it worked consistently, but until I used eScribe to tweak the settings, it did not perform nearly as well as my DNA 200 based mods, or even any of the Wismec / Joyetech mods. I have spent a lot of hours trouble shooting problems with the performance issues, until I finally got it right. The battery cap has a center mounted set screw, so that it can be adjusted for taller or shorter batteries. Wismec Reuleaux RX75 – This mod, as expected, is spot on right out of the box. I don’t have too much to say here, because it worked exactly as expected every time. The pre-configured SS-316L (my current choice of coil material) settings perform admirably, and it is easy to set up to three custom TCRs for any coil wire. 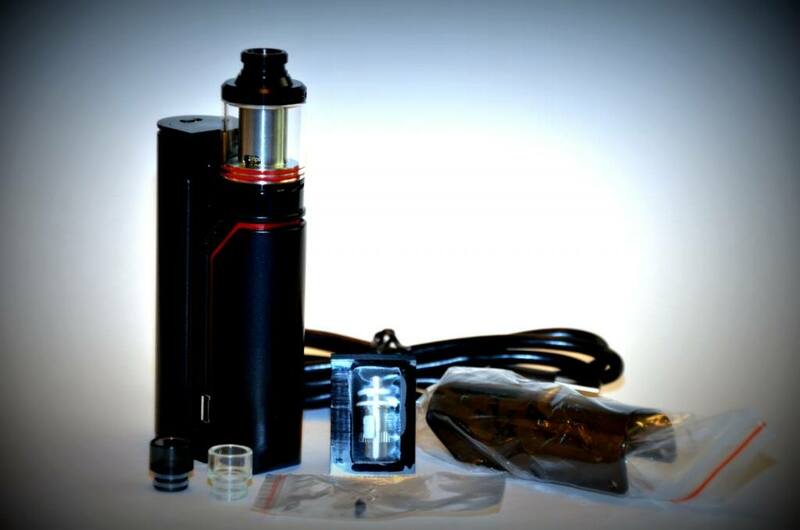 HCigar VT75 – The pre-programmed settings on this mod were not ideal for any of my tanks, and due to the crappy connections of the threads, it did not work consistently straight out of the box. Once I cleaned the threads (with a Dremel and wire brush attachment), consistency improved, but I still had to go into eScribe to get the VT75 performing the way it should. Once everything was finally set though, this mod was as consistent as any other Evolv based mod I have ever used. Wismec Reuleaux RX75 – Again, no surprises here, like every other Wismec / Joyetech based mod I own, battery performance is exceptional in my usage. Power management is stellar, and with my normal settings, a single 18650 lasts a whole day. 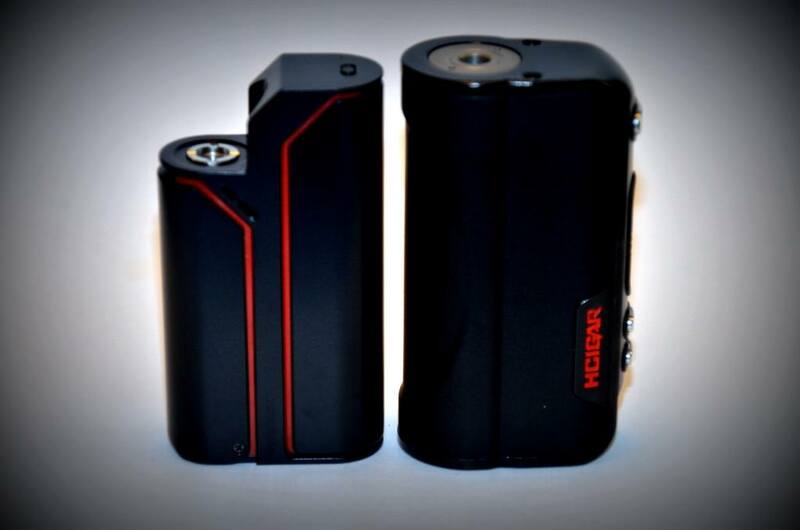 HCigar VT75 – Battery performance, while not quite as good as the RX75, is also exceptional when using identical 18650 batteries, and with a 26650 battery, it definitely outlasts the RX75. Power management seems to be 3-5% worse than the RX75, I consistently got about 20-30 minutes less vape time with 18650 batteries, but that isn’t bad. TC is not well implemented out of the box, but once tuned beats almost everything else in my collection. Wismec Reuleaux RX75 Summary – The RX75 worked perfectly with every tank I own (except the one it came with), and is a real joy to just pick up and vape. It has some issues, like the hinged front panel and rear mounted fire button. Functionally it performs really well, as can be expected from any Wismec / Joyetech mod. 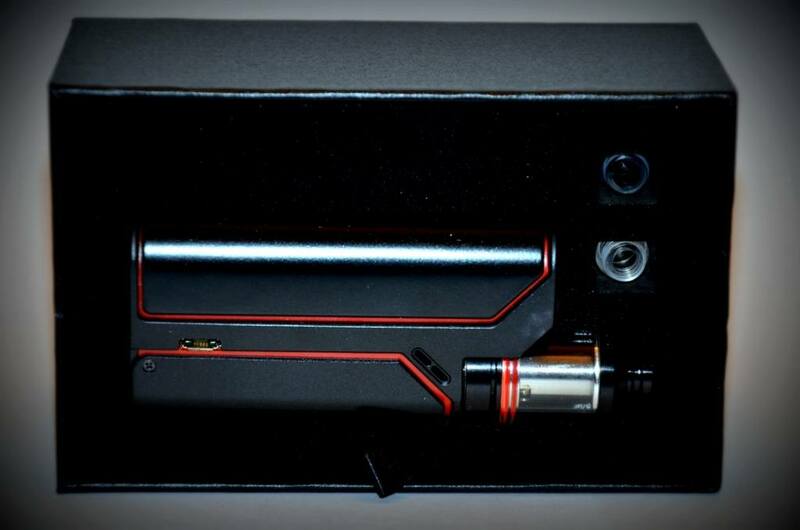 HCigar VT75 Summary – The VT75 had no issues with any of my tanks. Unfortunately it did not just work like the RX75. The Evolv chip set is phenomenal when tuned in for your build, but the default settings are not nearly what they should be to just use the mod. 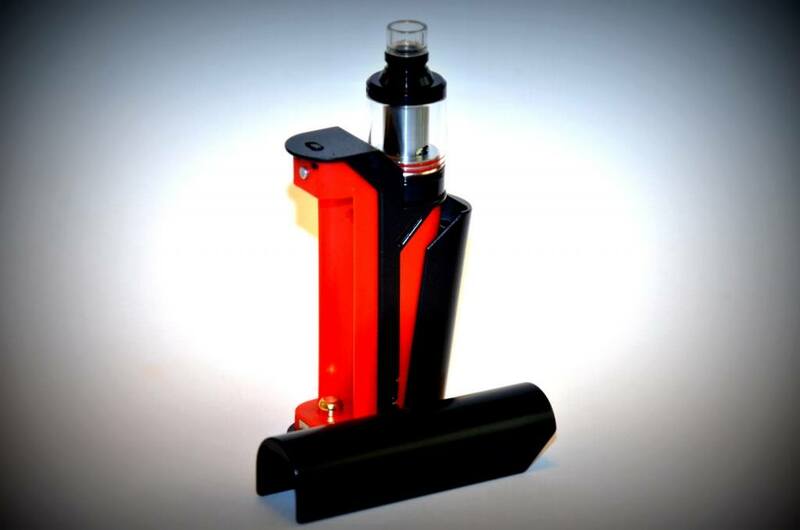 The mod also has issues with the design, such as the painted over threads that need to be thoroughly cleaned before a stable connection is made, and the annoying rattle when using the 18650 battery adapter. Both of these mods feel like they were rushed to market, and could have benefited by a little longer development and test cycle to work out some of the issues before going into production. However, that said, the winner in this head to head battle, by an ever so slight margin, must go to the RX75 for overall design and implementation. In my opinion the VT75 has an overall better design, but given the tuning problems and other headaches I experienced, it loses out to the RX75 by a very small margin. If the VT75 had a stable electrical connection and worked better out of the box, Evolv’s legendary performance from the DNA series chip sets would have given it a substantial advantage, so suffice it to say that if the HCigar had a few less issues, it would have come out on top by a long shot. Ultimately though, for the price and performance, either of these mods will suit you well if you can live with their disadvantages.